Help with the research, development, creation and presentation of new business opportunities. Be clear about your differentiator; what are your core product advantages? Brainstorm for opportunities around your current customers; who is nearby? who else might you reach? Brainstorm for opportunities around your current featureset; what small investments might yield large benefits? Work up the ideas that are feasible; which scenarios could you deliver, and how would you do it? Prioritise these ideas into a plan of action; which of the above should you do? in which order? what are your core product advantages? Many entrepreneurs mistakenly feel that they should be able to deliver everything that the “big players” do. Do not fall into this trap – it is not the case. Brainstorm for opportunities around your current customers. With your specialisation in mind, who else might you reach? Are there similar customers in other geographical regions? Brainstorm for opportunities around your current featureset. what small investments in might yield large benefits? if you are a small business, you can change rapidly, and this is an advantage. which of the ideas developed from the above could be delivered? put a simple plan in place. which of the above should you do? roll it out. Do it. This template features a Business Roadmap with SWOT & Timeline. Your complete business roadmap template. Plan your roadmap and manage your risk. >> view details. 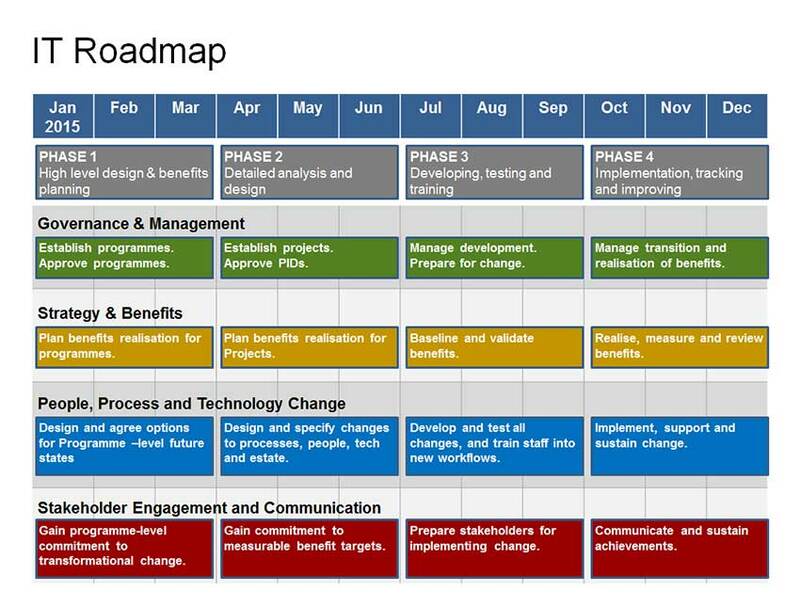 The Change Programme Roadmap shows clear transition, benefits, and objectives of your change programme. Map out your workstreams and KPIs - all on 1 sheet. >> view details. This dynamic SWOT with Dynamic Indicators template automatically adjusts the summary bars by the factors in each area. Show a dynamic & relative SWOT. >> view details. This Innovation Project Proposal Template outlines a "People-led" Innovation Project. There are step-by-step instructions and notes to help you. >> view details. This Template covers the internal governance around launching a new product within your organisation. Make sure your audit trail is complete! >> view details. Show your Plans. 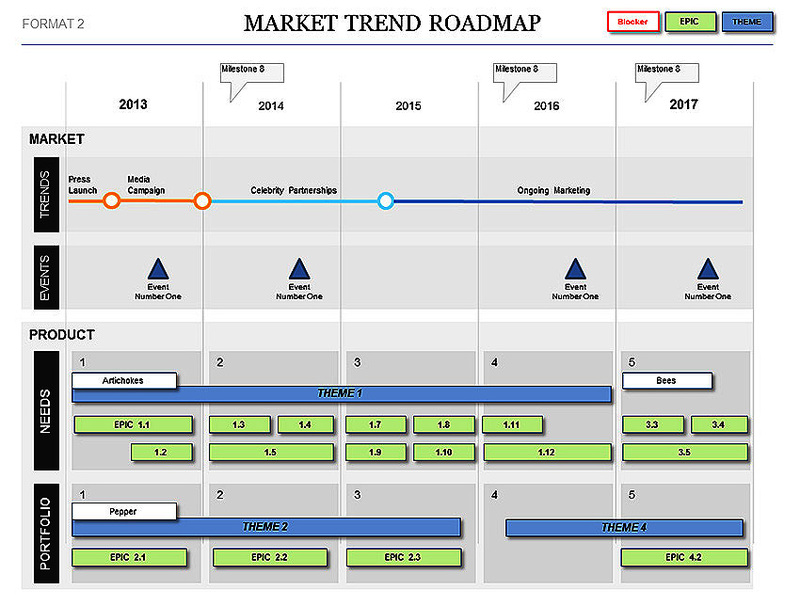 Market Projections, Events and KPIs with the Market Trend Roadmap Template. The Powerpoint slides are easy to edit, & look great. >> view details. The Powerpoint Agile Roadmap Template features 4 agile formats: Dashboard, Iteration, Theme, and 2-year Roadmaps - all in easy to edit Powerpoint Slides. >> view details. The Powerpoint Product Roadmap Template is a "must have" for Product Managers. Shows your product plans by workstream, over 1-2 year timespan. >> view details. This Simple SWOT Template is an easy to edit SWOT layout. Add to presentation and add your Strengths, Weaknesses, Opportunities and Threats. >> view details. This Strategy Delivery template shows your Plan, KPIs, Milestones & Project Goals clearly on 1 side of paper - Ideal for busy executives! >> view details. This SWOT Analysis Templates collection features 24 Powerpoint guidance and template slides: cheat sheet, list, prioritisation, actions, and SWOT Plan. >> view details. The Strategic SWOT Template Collection includes our most successful SWOT templates at a discount of 55%: Strengths, Weaknesses, Opportunities, & Threats >> view details. Need to manage a large organisational change / Re-Org? This Transition Plan Template will show your "Change Plans" in a simple 1-sider for all stakeholders. >> view details. Are you working on a Startup or New Product Development (NPD)? You can plan and present your new product development using these cutting edge, simple templates. >> view details. This Powerpoint Proof of Concept template is designed with the corporate world in mind. It conveys all the priority areas to ensure executive sign off. >> view details. Answer Count: 1 When was the question asked? 2009/12/02 3:04:15 PM By Jeff Armstrong .